The Emory Global Health Institute celebrated the 10th anniversary of its annual International Emory Global Health Case Competition on March 15-16 by hosting 30 university teams charged with developing hurricane preparedness strategies for multiple countries. This year’s winning team traveled halfway around the globe from Melbourne, Australia to participate and help EGHI mark the competition’s milestone year. Phil Batterham, PhD, and his colleagues at the University of Melbourne have been sending student teams to the global health case competition since 2014. He learned about the opportunity during a conference where he met Mo Ali, PhD, a Rollins School of Public Health faculty member who had participated in the competition as a faculty advisor. Batterham was intrigued and advocated for the University of Melbourne to send a team to Emory. “A group of students from different disciplines focusing the best of their abilities on a shared goal of providing a realistic solution to a wicked global health problem is one of the best possible educational experiences that any university could offer,” Batterham explains, as one of the primary reasons why he has sent top students to the competition for the past six years. “The opportunity for our students to test themselves in competition against students from some of the best universities in the world is something they relish,” he adds. The Emory Global Health Case Competition began in 2009 and was developed and initially coordinated by members of EGHI’s first Student Advisory Committee. The first competition took place on a Saturday morning and included eight multidisciplinary teams representing numerous Emory schools. The program has grown significantly both in scope and popularity over the last 10 years, with EGHI hosting an annual intramural competition reserved for up to 12 multidisciplinary Emory student teams and an international competition that hosts the winning Emory team along with 29 teams from top universities located around the world. In addition to the University of Melbourne, 2019 participating universities included: Brown, Cornell, Emory, Georgia Tech, McMaster, Medical University of South Carolina, Miami University, NYU, Northwestern, Penn State, SUNY, Downstate, Uniformed Services University of the Health Sciences (USUHS), University of Alabama Birmingham (UAB), University of Kentucky, University of Minnesota, Notre Dame, University of Pennsylvania, University of Scranton, University of Texas Southwestern, University of Tampa, University of Toronto, UVA, University of Washington, Washington University in St. Louis, Yale, and Yeshiva. This year’s other top placing teams were USUHS (second place), UT Southwestern (third place), Yale (fourth place), and UAB (fifth place). “There is high demand for our international global health case competition each year. Since 2012, we have hosted 24 teams annually, but due to the program’s growing popularity, we decided to include six more teams in our 2019 competition. The 30 team slots were filled within the first 25 minutes of our application period, with several universities landing on our wait list,” says Rebecca Baggett, EGHI’s Director of Programs and Communications. While EGHI advertises the competition, much of its popularity has spread via word of mouth from past participants. “Participants tell us that they competed as an undergraduate at one university, and then introduced the competition to students at their graduate school. We also hear stories from participants who learned about the competition from a friend or classmate, which I think explains why we have so many universities that apply to participate year after year,” adds Baggett. “Friends who had participated before all had really positive things to say about the competition, Emory University, and Atlanta. The opportunity to think critically about a relevant global issue with a like-minded but professionally diverse group of students seemed too good to be true – and the experience certainly delivered,” says Anna Traill, a member of the 2019 University of Melbourne team. The multidisciplinary aspect of the competition is one of the ways that the program is unique. 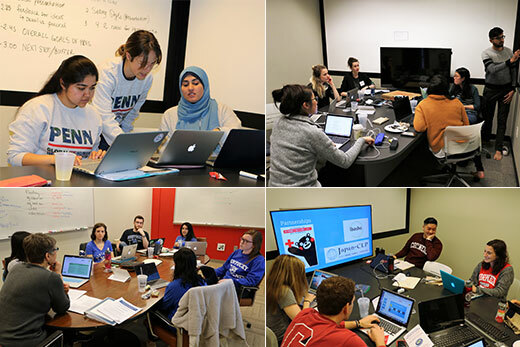 Not only are student teams required to be multidisciplinary, but the Emory student case writing group that develops the case subjects each year are also multidisciplinary. This year’s international case writers included Peter Richards, an Emory College senior studying psychology and human health, Jessie Preslar, an RSPH/MD student, and Eliana Paljug, an Emory/Georgia Tech biomedical engineering student. Additionally, EGHI recruits a professionally diverse group of judges to evaluate teams’ case solutions. “I think the program’s popularity continues to grow because it provides students from a variety of academic backgrounds the chance to work together on a real-world global health challenge in an environment that takes them out of the classroom. It challenges them to work on a problem that requires them to think about it from numerous perspectives and to package their solutions so that they are polished, compelling, and understandable, which is what they will have to do in any future professional endeavor,” says Jeffrey P. Koplan, MD, MPH, Emory vice president for global health. Georgia Gibson, a University of Melbourne team member agrees. “The opportunity to look at a case from all perspectives, not just from your own field, to come up with a solution, while consulting with experts across the world was the most rewarding experience I’ve had and I would recommend it to anyone who is even considering entering,” she says. “We have been really pleased with the experience the competition provides to students – whether they are participating in a team, as a case writer, or as an EGHI graduate assistant or volunteer helping to coordinate the program. We’ve had a great first 10 years and are looking forward to the next 10,” Koplan says.